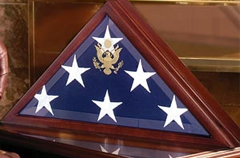 Our Fort Oglethorpe Army flag display case is hand made by Army veterans, and made from quality wood, we offer a real glass for our Fort Oglethorpe Army flag cases, and all orders for any flag cases will be shipped within 1-2 business day . This Fort Oglethorpe army case can be placed on shelves. 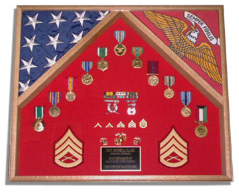 This Fort Oglethorpe Flag and Certificate Display Case is available in either a solid oak display case or walnut flag display case. 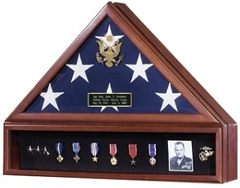 These Fort Oglethorpe and Certificate Display Cases are designed to beautifully display both a folded flag and other memorabilia in one convenient place. 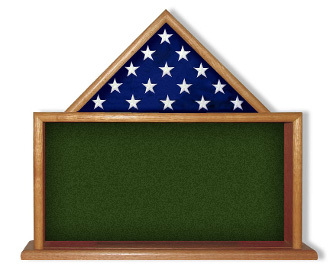 These solid oak and walnut Fort Oglethorpe Flag and Certificate Display Case can come with actual service uniform fabrics, not imitations, so you can rest assured that the fabric you receive in your case will be perfect for your branch of service. Even the wood is authentic – we do not stain our wood to create any type of appearance. What you see is what you get, in rich red oak or walnut, and we prefer to finish it with a clear coat to enhance the beautiful grain and preserve the natural color of the wood. 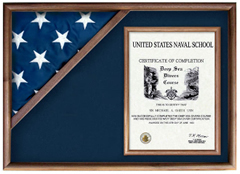 For those who want to display more than just one flag, this wonderful Fort Oglethorpe Flag and Certificate Display Case addition to a corner in your home or office is a keepsake for multiple purposes. 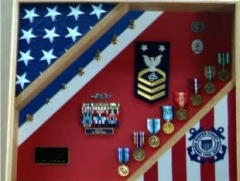 The combinations of flag and other type of memento are virtually endless. 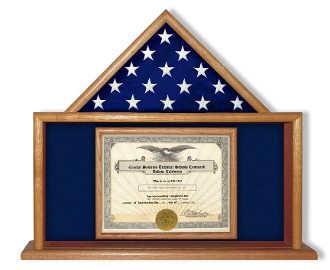 Use this Fort Oglethorpe Flag and Certificate Display Case as a military branch display case, a memorial flag display case, a burial flag display case or a Army flag as a Army flag display case. 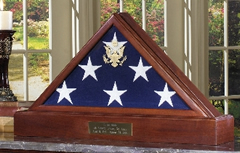 The Fort Oglethorpe Flag and Certificate Case is designed to sit on a shelf or mantle piece – it is 24 inches wide and just less than 21 inches high. 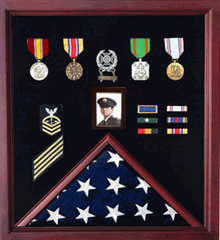 That Case Fort Oglethorpe Flag and Certificate Display Case is available in Oak or Walnut. 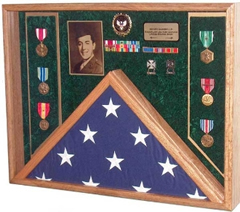 Orders for the Fort Oglethorpe Flag and Certificate Display Case are usually shipped out within one business day to places within the USA and Canada.